Above is Ken Mueller’s 200A that is in the Snowmobile Hall of Fame in Eagle River, Wisconsin. The following modifications were made through the production of the model 200 or as conversions that took place out in the field at the dealer level. 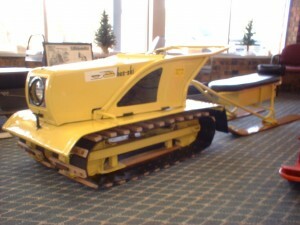 These eventually resulted in the Hus-ski model 200A. Throttle cable. Originally was equipped with a standard throttle cable design that wrapped under the engine. The low spot under the engine was prone to collecting moisture and freezing. Also due to the original design, the frozen throttle would not be detected by the operator unless they raised the hood and watch the carburetor, since the lever on the handle would not stick. This was later replaced with a rod and spring wire pull design for the throttle. Handle bars: Originally the handle bars came straight back toward the driver. This caused a clearance problem between the handle bars and the driver’s knees, especially when attempting to climb a steep bank. Later design include the handle bars with an upward bend right near the dash to increase clearance. Snow flap: Originally the model 200 included a hinged solid sheet metal flap. This design was prone to banging the drivers legs as the flap tipped up. That was removed and a re-enforced rubber flap was installed. All machines converted still include one half of that piano hinge and it is thought that due to chassis being built ahead, that some were distributed brand new with that one half piano hinge on the fender. Trailer: Originally the round bars on the trailer did not have a jog in them just in front of the ski pivot. The side bars ran straight from the ski pivot forward to the point that each side merged into the hitch, this caused foot pinching between the side round bar and the ski. Also, the later redesigned trailers had a larger diameter round bar used to make them stronger. Clutch: Originally the model 200 was installed with a Fairbanks Morse primary and secondary clutch. This system used a very narrow ‘V’ belt. That primary clutch used 1 inch steal balls as the fly weights. Those balls had a tendency to leave the clutch, especially if the engine was revved up without the belt installed. That transmission design was replaced with a Hus-ski manufactured aluminum bell primary and a pin shift secondary. Hood latch: Originally the model 200 included a Aluminum over the center type latch that was prone to popping open. That was replaced with an antique style automotive spring hood latch, much like that used on the Ford model A and T.
Track slides: Originally the model 200 had stainless steel skins wrapped around the wood slides. This was extremely good from a friction stand point, but as wear and tear occurred, the lower corners of that stainless steel would crack and become a saw that would eventually saw the cleats in two. That metal skins were never installed on later models. Seat: Originally all Hus-ski models included red seats. Starting in 1965, black seats were used. 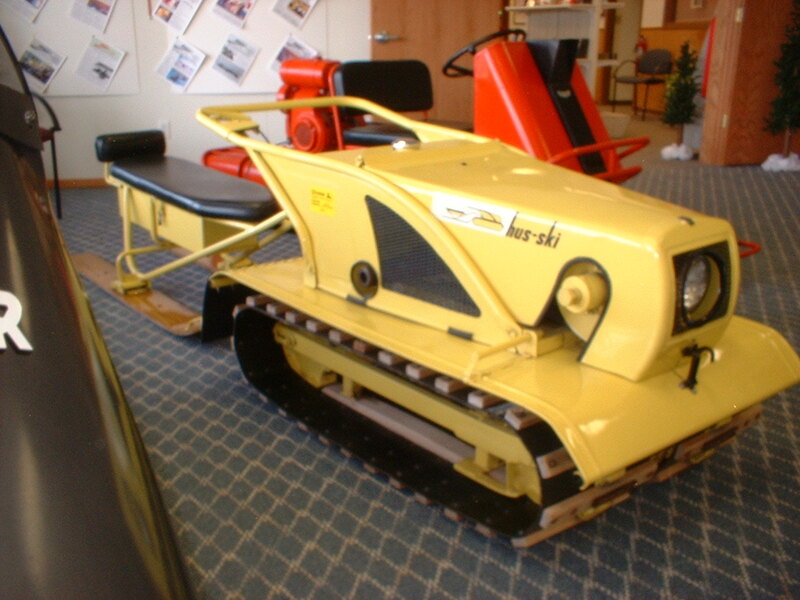 Any model 200A produced in 1965 would have had the black seat. This change might be debatable depending on how many model 200A were sold as a model year of 1965. Also, most models starting in 1965 include the previously optional back rest. Additional note: The model 400 would have experienced some of the conversions listed above at the dealer level, but certainly not all of them.